Description: Since the late nineteenth century, New Testament scholars have operated on the belief that most, if not all, of the narrative parables in the Synoptic Gospels can be attributed to the historical Jesus. This book challenges that consensus and argues instead that only four parables�those of the Mustard Seed, the Evil Tenants, the Talents, and the Great Supper�can be attributed to the historical Jesus with fair certitude. 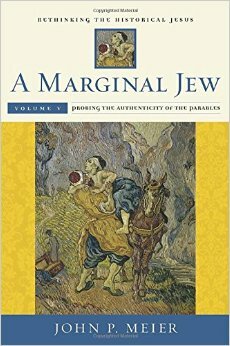 In this eagerly anticipated fifth volume of A Marginal Jew, John Meier approaches this controversial subject with the same rigor and insight that garnered his earlier volumes praise from such publications as the New York Times and Christianity Today. This seminal volume pushes forward his masterful body of work in his ongoing quest for the historical Jesus. Citation: Tobias (Full Membership) H�gerland, review of John P. Meier, A Marginal Jew: Rethinking the Historical Jesus, Volume 5: Probing the Authenticity of the Parables, Review of Biblical Literature [http://www.bookreviews.org] (2018).